MicroRNAs (miRNAs) are small noncoding RNA molecules with lengths of approximately 20–22 nucleotides and participate in posttranscriptional gene regulation., MiRNAs are stable and resistant to degradation., These characteristics make miRNAs potential biomarkers in the forensic practice of identifying antemortem and postmortem burns. In this study, microarray analysis was conducted to determine gene expression profiles in the skin of an experimental burn model. The efficacy of this technique was evaluated to reveal differentially expressed miRNAs as potential markers for vital reactions. Study 1: Six male BALB/c mice (7–9 weeks old; 25 ± 3 g) were obtained from the Laboratory Animal Centre of Southern Medical University. Three mice (labeled as M1, M2, and M3) were anesthetized by intraperitoneal injection of 0.3% pentobarbital sodium (50 mg/kg), and then shaved to expose the skin area with an electric razor. Dorsal skin was exposed to a heated (100°C) 30 mm × 10 mm sheet of copper for 4 s. This procedure generated a deep partial thickness burn in the back skin of the mice , [Figure 1]. After 30 min, the mice were sacrificed under deep anesthesia with pentobarbital sodium (60 mg/kg intraperitoneal [IP]). The antemortem burned dorsal skin was excised from the three mice. Three unburned three mice (labeled as M4, M5, and M6) were also sacrificed under deep anesthesia with pentobarbital sodium (60 mg/kg IP). Group 1 included antemortem burned mice skin (burned M1, M2, and M3), while Group 2 included external control unburned mice skin (unburned M4, M5, and M6). All samples were immediately submerged in 1 mL of RNA stabilization solution (RNAlater, Ambion, Austin, TX, USA). Three RNA samples from each group were prepared and designated as internal Burned M1, M2, and M3 and external control M4, M5, and M6. Study 2: Sixteen male BALB/c mice were used for secondary evaluation by reverse transcription real-time (RT)-quantitative polymerase chain reaction (qPCR). The dorsal skin of 8 mice was first exposed to heated sheet of copper for 4 s as described above (antemortem burn skin specimen). After 30 min, the mice were sacrificed under deep anesthesia with pentobarbital sodium. Thirty minutes after sacrifice, the same mice with unburned ventral skin were exposed to the heated sheet of copper for 4 s again (postmortem burned skin specimen). The antemortem skins and postmortem burned skin were excised immediately. Eight unburned mice were shaved with an electric razor to expose the skin and sacrificed under deep anesthesia with pentobarbital sodium without the burn. All skin samples were immediately submerged in 1 mL of RNA stabilization solution (RNAlater) and stored at −80°C until further examination. This study was reviewed and approved by the Ethics Committee of Southern Medical University Institutional Board (Guangzhou, China). Total RNA was quantified using the NanoDrop ND-2000 (Thermo Fisher Scientific, Waltham, MA, USA), and RNA integrity was assessed using the Agilent Bioanalyzer 2100 (Agilent Technologies, Santa Clara, CA, USA). Sample labeling, microarray hybridization, and washing were performed based on the manufacturer's standard protocols. Briefly, total RNA was dephosphorylated, denatured, and labeled with Cyanine-3-CTP. After purification, the labeled RNAs were hybridized onto the microarray. After washing, the arrays were scanned with the Agilent Scanner G2505C (Agilent Technologies, Santa Clara, CA, USA). Feature Extraction software (version 10.7.1.1, Agilent Technologies, Santa Clara, CA, USA) was used to analyze array images to obtain raw data. Next, Genespring software (version 13.1, Agilent Technologies, Santa Clara, CA, USA) was employed to complete the basic analysis of the raw data. Initially, the raw data were normalized using the quantile algorithm. 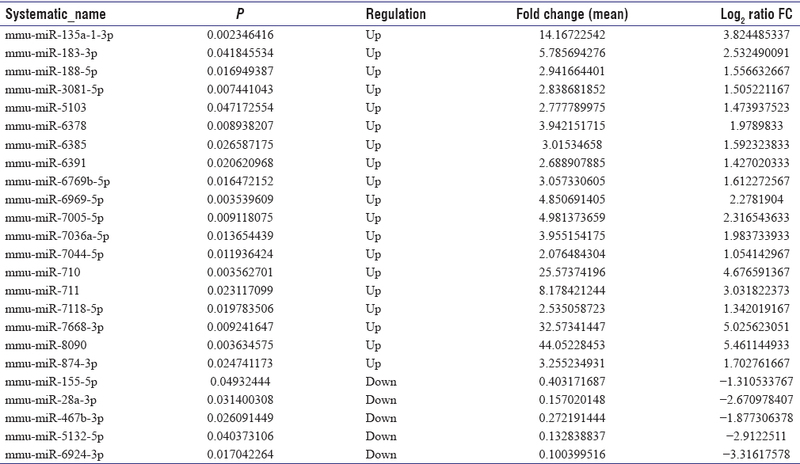 Differentially expressed miRNAs were then identified through their fold-changes and P values calculated using the t-test. The threshold for up- and down-regulated genes was a fold-change of ≥ 2.0 and P ≤ 0.05. 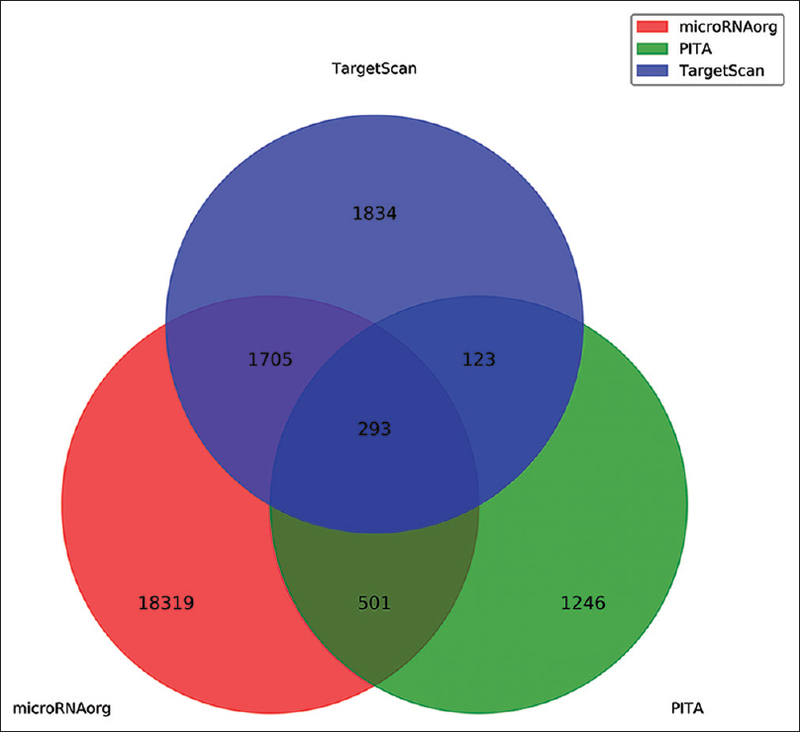 To predict potential target genes, three databases (Targetscan, microRNAorg, PITA) were used, and target genes predicted by these three databases were selected for further analysis. Genes were selected for Gene Ontology (GO), Kyoto Encyclopedia of Genes and Genomes (KEGG) pathways, and Protein-Protein Interactions (PPI) analysis by using the DAVID (https://david.ncifcrf.gov) and STRING databases (http://string-db.org). The GO project is an international standardized gene functional classification system that describes gene attributes, including biological process, molecular function, and cellular component. The KEGG database is the major public pathway-related database. A critical assessment and integration of PPI can be conducted using the STRING database, which includes direct (physical) as well as indirect (functional) associations. The information stems from computational prediction, knowledge transfer between organisms, and interactions aggregated from primary databases. Briefly, cDNA copies of total RNA were obtained using the PrimeScript RT reagent Kit (TaKaRa, Shiga, Japan). RT-qPCR was conducted in 48-well reaction plates with an Illumina Eco Real-Time PCR System (San Diego, CA, USA) and SYBR green kit (TaKaRa) according to the manufacturer's recommendations. U6 was used as an endogenous control for the RT-qPCR, and the relative expression levels were determined by the 2−ΔΔCt method. 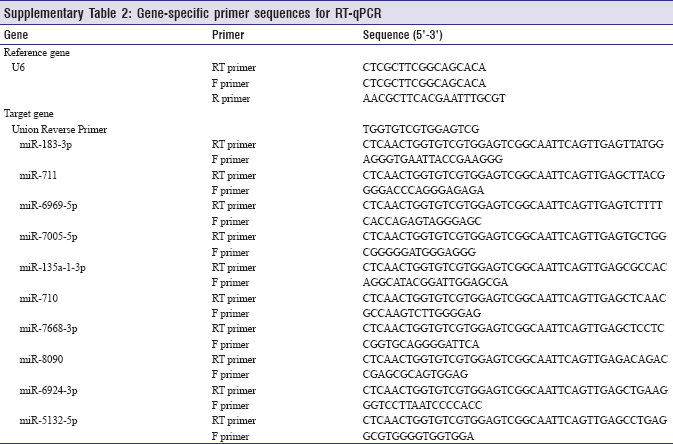 The RT-qPCR conditions, thermal cycler parameters, and gene-specific primers used for amplification are listed in [Supplementary Table 1] and [Supplementary Table 2]. All RT-qPCR experiments were performed in triplicate, and the results were reported as the mean ± standard error of the mean Correlation analyses between miRNA microarray and RT-qPCR data were performed using linear regression (Pearson correlation analysis). The Student's t-test (two-tailed) was used to compare groups. Statistical analyses were performed using GraphPad Prism version 5.01 (GraphPad, Inc., La Jolla, CA, USA). P < 0.05 was considered to indicate statistical significance. Antemortem burned skins (Burned M1, M2, and M3) were analyzed by computational approaches and compared to skins from unburned mice (external control M4, M5, and M6). Expression differences are shown in a volcano map in [Figure 2]. 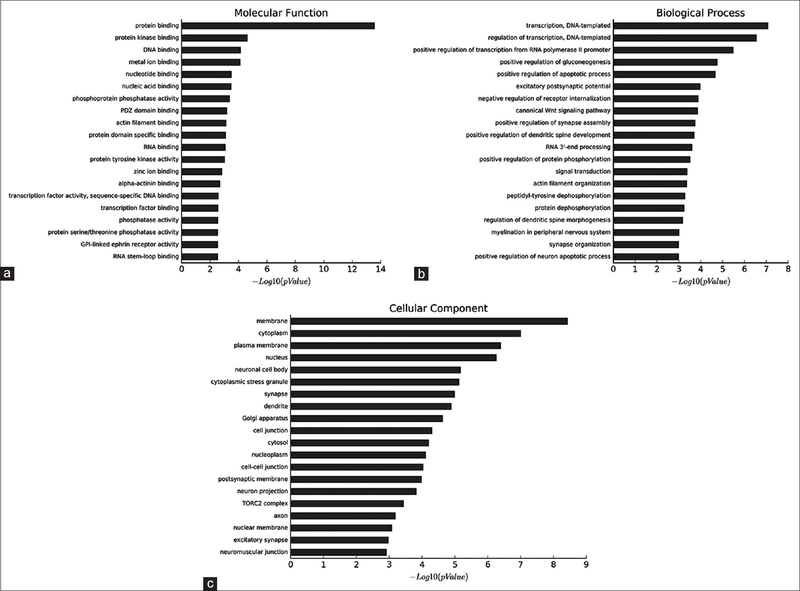 Microarray analysis revealed 24 differentially expressed miRNAs in antemortem burned mice skin compared to those in unburned skins, with 19 miRNAs significantly upregulated and 5 downregulated [Table 1]. To further determine the biological functions of these 24 differentially expressed miRNAs, intersections predicted using three databases (Targetscan, microRNA. org, and PITA) were used to predict the target genes, which revealed 293 putative target genes [Figure 3] and [Supplementary Table 3]. The functions of these target genes were determined by GO analysis. Significant GO terms corresponding to molecular functions included “Protein binding,” “Protein kinase binding,” “DNA binding,” and “Metal ion binding” [Figure 4]a. The main GO terms for a biological process included “Transcription, DNA-templated,” “Regulation of transcription, DNA-templated,” “Positive regulation of transcription from RNA polymerase II promoter,” and “Positive regulation of gluconeogenesis” [Figure 4]b. 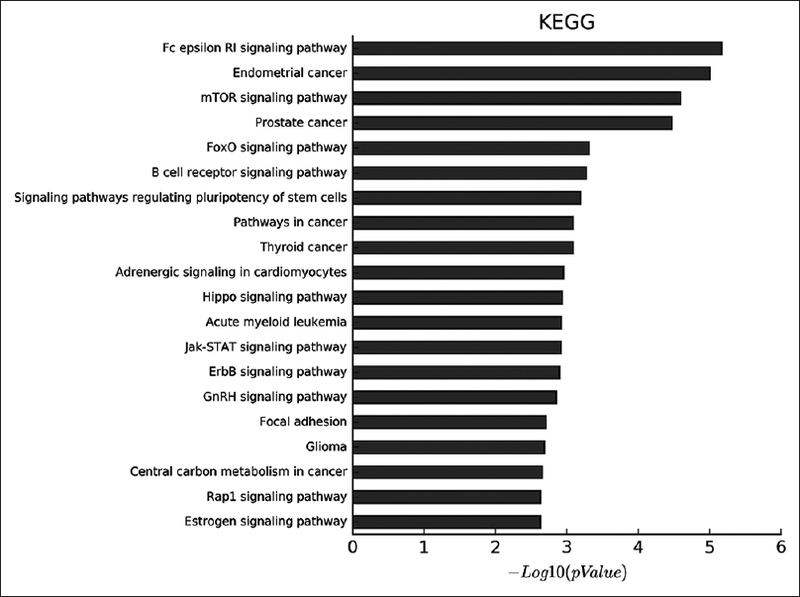 The significant GO categories corresponding to cellular components included “Membrane,” “Cytoplasm,” “Plasma membrane,” and “Nucleus” [Figure 4]c. KEGG pathway analysis demonstrated that “Fc epsilon RI signaling pathway,” “Endometrial cancer,” “mTOR signaling pathway,” and “Prostate cancer” were the most enriched pathways containing differentially expressed genes (DEGs) [Figure 5]. STRING software was used to analyze the PPI networks of the DEGs [Supplementary Figure 1]. All qPCRs yielded a single peak on the dissociation curve, indicating specific amplification using the primers. To evaluate the microarray results, 10 miRNAs (upregulated miRNAs: mmu-miR-6969-5p, mmu-miR-7005-5p, mmu-miR-183-3p, mmu-miR-711, mmu-miR-135a-1-3p, mmu-miR-710, mmu-miR-7668-3p, mmu-miR-8090; downregulated miRNAs: mmu-miR-6924-3p, mmu-miR-5132-5p) were selected randomly for RT-qPCR confirmation [Table 2]. 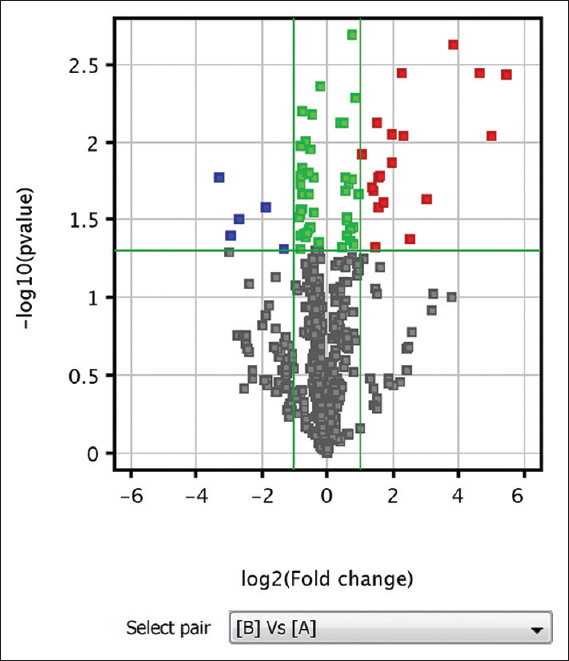 The results of RT-qPCR were consistent with the microarray data for these genes [Figure 6]a. The regression equation between microarray (x) and RT-qPCR (y) data (Log2 Ratio) was y = 0.8851x + 0.3134, with an r2 of 0.9074, confirming the microarray data obtained in the present study [Figure 6]b. These results were also validated when the number of mice was increased to 8 in each group. The expression levels of mmu-miR-6969-5p, mmu-miR-7005-5p, mmu-miR-183-3p, mmu-miR-711, mmu-miR-135a-1-3p, mmu-miR-710, mmu-miR-7668-3p, and mmu-miR-8090 were higher in antemortem burned skins than in postmortem burned and unburned skins. The expression levels of mmu-miR-6924-3p and mmu-miR-5132-5p were lower in antemortem burned skins than in postmortem burned and unburned skins. However, differences were not observed between unburned skins and postmortem burned skins [Figure 6]c.
When a fire results in fatality, the possibility of attempted concealment of a homicide should be evaluated. However, conventional external and/or internal indicators are sometimes unspecific, unremarkable, or even absent. Therefore, novel markers for wound vitality are urgently needed in forensic practice. Previous studies indicated that some functional categories and signaling pathways are useful for determining wound vitality.,,, Gauchotte reported that CD15 and tryptase were useful markers for the vital reaction. Hernández-Cueto suggested that cathepsin D is a useful marker for diagnosing wound vitality. Few studies have examined fire death. In several studies increased heat-shock protein 70, fibronectin, P-selectin, von Willebrand factor, and PECAM-1 were observed in the respiratory tract and lungs of fire victims.,, Hidemichi reported that the mRNA expression of AQP3 was increased in antemortem burn skin. MiRNAs are small noncoding RNA molecules. Extracted miRNAs are stable at room temperature for 1 year and remain detectable in storage at −20°C for 10 years. Thus, they are useful for forensic practice. In this study, miRNA microarray analysis was conducted to determine the miRNA expression profiles in the skin of an experimental burn model. A total of 19 upregulated and 5 downregulated miRNAs were detected in burned mice skins compared to that in unburned skins. In addition, 10 differentially expressed miRNAs were selected randomly, and their expression levels were examined as a secondary check (n = 8) by RT-qPCR. The expression levels of these miRNAs in antemortem burned and unburned groups were consistent with the microarray data, confirming that our microarray data is reliable. In the present study, postmortem burned specimens obtained from antemortem burned mice were also examined. The 10 differentially expressed miRNAs listed above showed significant differences between antemortem burned skins and postmortem burned skins and between unburned skins. However, no difference was detected between postmortem burned specimens and unburned skins. 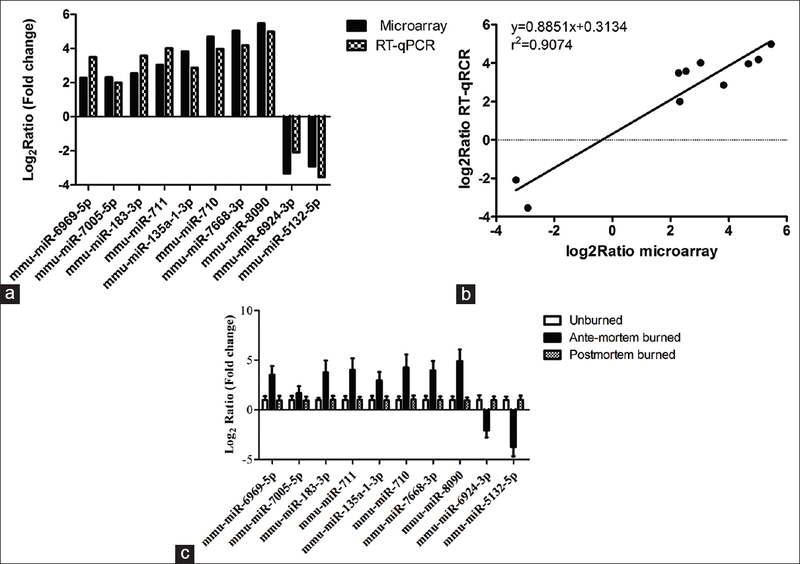 These results indicate that the differentially expressed miRNAs detected by microarray are not affected by postmortem burn and thus are potential markers for vital reaction to burns, although further validation is needed. Using three databases (Targetscan, miRNA.org, PITA), 293 target genes were predicted. GO analysis of these 293 genes revealed that “transcription, DNA-templated,” “protein binding,” and “membrane” were enriched GO terms containing DEGs belonging to biological process, molecular function, and cellular component, respectively. 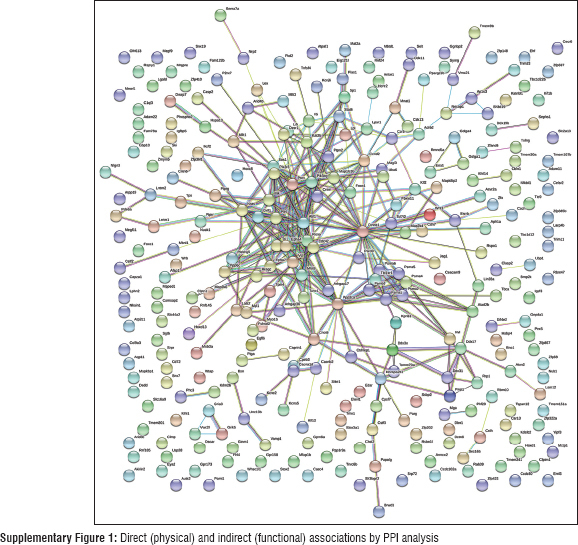 KEGG pathway analysis demonstrated that “Fc epsilon RI signaling pathway,” “Endometrial cancer,” and “mTOR signaling pathway” were the most enriched pathways. These bioinformatic analyses may improve the understanding of the process of wound healing, particularly in the early phase. In our previous study, we used Illumina RNA-seq technology to determine gene expression profiles in contused mouse skin. Genes from different functional categories and signaling pathways were enriched, including immune system process, immune response, defense response, cytokine − cytokine receptor interaction, complement and coagulation cascades, and chemokine signaling pathway. The results were quite different from those of this study. These differences may be because of the different models of injury used. Exposure to heat may seriously affect the expressions of miRNAs and differ from mechanical injury. Further studies of human samples and various types of wound samples are needed to clarify the underlying mechanism. In summary, this is the first study to use miRNA microarray analysis to analyze an experimental skin burn model. A total of 19 upregulated and 5 downregulated miRNAs were detected in burned mice skins. Our findings indicate that miRNA microarray is a powerful tool for revealing differentially expressed miRNAs as potential markers for vital reaction to burns, although further investigations are required to confirm these results. This research was supported by the National Natural Science Foundation of China (Grant No. 81401556 and 81601641), the Natural Science Foundation of Guangdong Province (No. 2014A030310504 and 2014A030310293), the Scientific Research Foundation for the Returned Overseas Chinese Scholars, State Education Ministry (No. 2015-311), and the Special Foundation of President of School of Public Health of Southern Medical University (Grant No.GW201619). Janssen W. Injuries caused by heat and cold. Forensic Histopathology. Berlin: Springer; 1984. p. 234-60. Saukko P, Knight B. Knight's Forensic Pathology. 3rd ed. London: Arnold; 2004. p. 312-25. Marschall S, Rothschild MA, Bohnert M. Expression of heat-shock protein 70 (Hsp70) in the respiratory tract and lungs of fire victims. Int J Legal Med 2006;120:355-9. Bohnert M, Anderson J, Rothschild MA, Böhm J. Immunohistochemical expression of fibronectin in the lungs of fire victims proves intravital reaction in fatal burns. Int J Legal Med 2010;124:583-8. Weis A, Bohnert M. Expression patterns of adhesion molecules P-selectin, von willebrand factor and PECAM-1 in lungs: A comparative study in cases of burn shock and hemorrhagic shock. Forensic Sci Int 2008;175:102-6. Grellner W. Time-dependent immunohistochemical detection of proinflammatory cytokines (IL-1beta, IL-6, TNF-alpha) in human skin wounds. Forensic Sci Int 2002;130:90-6. Liu T, Yang F, Li Z, Yi C, Bai X. A prospective pilot study to evaluate wound outcomes and levels of serum C-reactive protein and interleukin-6 in the wound fluid of patients with trauma-related chronic wounds. Ostomy Wound Manage 2014;60:30-7. Abo El-Noor MM, Elgazzar FM, Alshenawy HA. Role of inducible nitric oxide synthase and interleukin-6 expression in estimation of skin burn age and vitality. J Forensic Leg Med 2017;52:148-53. Kimura A, Ishida Y, Nosaka M, Shiraki M, Hama M, Kawaguchi T, et al. Autophagy in skin wounds: A novel marker for vital reactions. Int J Legal Med 2015;129:537-41. Jiang SK, Zhang M, Tian ZL, Wang LL, Zhao R, Li SS, et al. The distribution and time-dependent expression of MAGL during skeletal muscle wound healing in rats. Histol Histopathol 2015;30:1243-54. Zheng JL, Yu TS, Li XN, Fan YY, Ma WX, Du Y, et al. Cannabinoid receptor type 2 is time-dependently expressed during skin wound healing in mice. Int J Legal Med 2012;126:807-14. Ishida Y, Kimura A, Nosaka M, Kuninaka Y, Shimada E, Yamamoto H, et al. Detection of endothelial progenitor cells in human skin wounds and its application for wound age determination. Int J Legal Med 2015;129:1049-54. Ishida Y, Kuninaka Y, Nosaka M, Kimura A, Kawaguchi T, Hama M, et al. Immunohistochemical analysis on MMP-2 and MMP-9 for wound age determination. Int J Legal Med 2015;129:1043-8. Eulalio A, Huntzinger E, Izaurralde E. Getting to the root of miRNA-mediated gene silencing. Cell 2008;132:9-14. Mitchell PS, Parkin RK, Kroh EM, Fritz BR, Wyman SK, Pogosova-Agadjanyan EL, et al. Circulating microRNAs as stable blood-based markers for cancer detection. Proc Natl Acad Sci U S A 2008;105:10513-8. Zhang Y, Bai X, Wang Y, Li N, Li X, Han F, et al. Role for heat shock protein 90α in the proliferation and migration of HaCaT cells and in the deep second-degree burn wound healing in mice. PLoS One 2014;9:e103723. Xiao M, Li L, Li C, Zhang P, Hu Q, Ma L, et al. Role of autophagy and apoptosis in wound tissue of deep second-degree burn in rats. Acad Emerg Med 2014;21:383-91. Szklarczyk D, Franceschini A, Wyder S, Forslund K, Heller D, Huerta-Cepas J, et al. STRING v10: Protein-protein interaction networks, integrated over the tree of life. Nucleic Acids Res 2015;43:D447-52. Tian ZL, Jiang SK, Zhang M, Wang M, Li JY, Zhao R, et al. Detection of satellite cells during skeletal muscle wound healing in rats: Time-dependent expressions of pax 7 and MyoD in relation to wound age. Int J Legal Med 2016;130:163-72. Gauchotte G, Wissler MP, Casse JM, Pujo J, Minetti C, Gisquet H, et al. FVIIIra, CD15, and tryptase performance in the diagnosis of skin stab wound vitality in forensic pathology. Int J Legal Med 2013;127:957-65. Hernández-Cueto C, Lorente JA, Pedal I, Villanueva E, Zimmer G, Girela E, et al. Cathepsin D as a vitality marker in human skin wounds. Int J Legal Med 1993;106:145-7. Kubo H, Hayashi T, Ago K, Ago M, Kanekura T, Ogata M, et al. Forensic diagnosis of ante- and postmortem burn based on aquaporin-3 gene expression in the skin. Leg Med (Tokyo) 2014;16:128-34. Mayes C, Seashols-Williams S, Hughes-Stamm S. A capillary electrophoresis method for identifying forensically relevant body fluids using miRNAs. Leg Med (Tokyo) 2018;30:1-4. Xu J, Zhao R, Xue Y, Xiao H, Sheng Y, Zhao D, et al. RNA-seq profiling reveals differentially expressed genes as potential markers for vital reaction in skin contusion: A pilot study. Forensic Sciences Research 2018;3:153-60.